Every Friday, we get fish in Howth. If the fishing has been good then we’ll get enough for a few meals over the weekend. If not, then it’s simply a white fish for one meal. 52 weeks of the year we eat fish at least once a week. We are the third generation of our family to shop at Nicky’s Plaice on the pier in Howth. When our family started it was commonplace to only eat fish on Fridays in Ireland as part of the Catholic faith. Nowadays it’s our “Fresh Fish Friday” that has become a family tradition. The 2-year-old in particular loves his fish. My mother-in-law is the most skilled person I know at cooking fresh white fish with simply a dusting of seasoned flour. She is the person who taught me to ask for the tail of the fish and not for a fillet or darne. The tail is narrower than the centre body of a large fish like a cod or a salmon. It’s harder for the fishmonger to sell a tail as people now like to buy prepared pieces in portion sizes. I buy the tail and portion it out amongst the family. Typically I’ll get enough for us all from 1 tail and it costs between €4-€7 depending on the season and availability. This is slightly more expensive than my usual meals but it is still far, far cheaper than buying 1 portion of fresh cod and chips from a takeaway (nevermind feeding a family). It’s also much better for you. 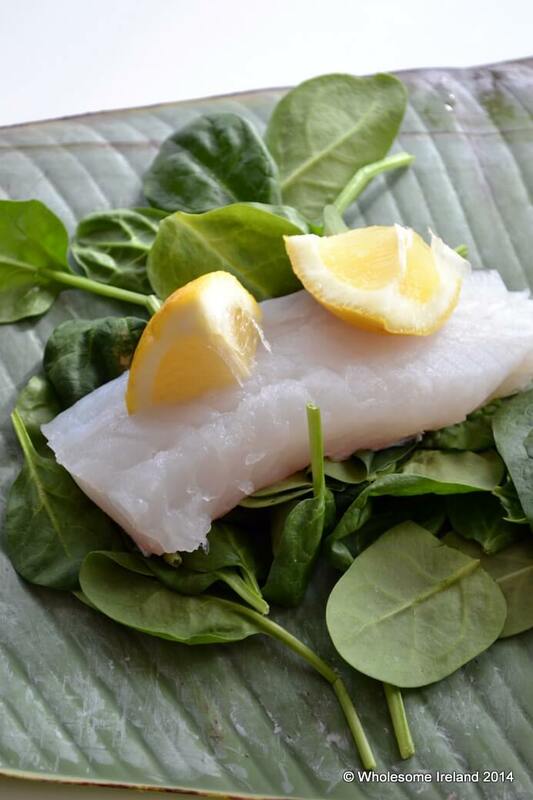 If you would like to try this recipe with alternative white fish you can ask for haddock, hake, cod-ling and coley as they are cheaper to buy in Ireland. Cod is a premium fish! 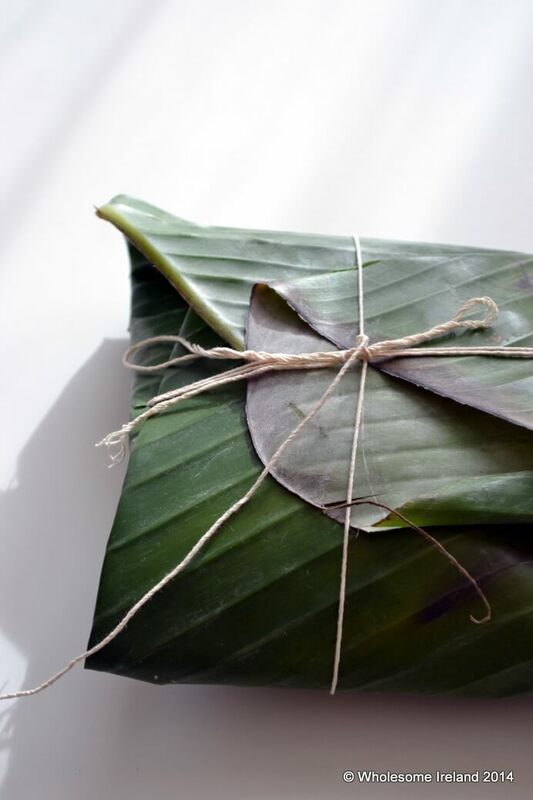 In this recipe I wrapped the fish inside of a fresh banana leaf. It looks lovely (they’re €2 for a big packet in the chiller cabinet of the Asian Supermarket) but it works just as well with a piece of baking parchment so don’t worry! Preheat a (fan) oven to 190 degrees Celsius and boil a kettle. Cut out 5 large squares (about 2 hand lengths square) of baking parchment and also cut 5 lengths of twine about as long as the distance between your elbow and your fingertips. Check the fish for pinbones and remove them if you find any. Do this by running your fingers down the middle of the piece of fish. Section the fish into 5 pieces. 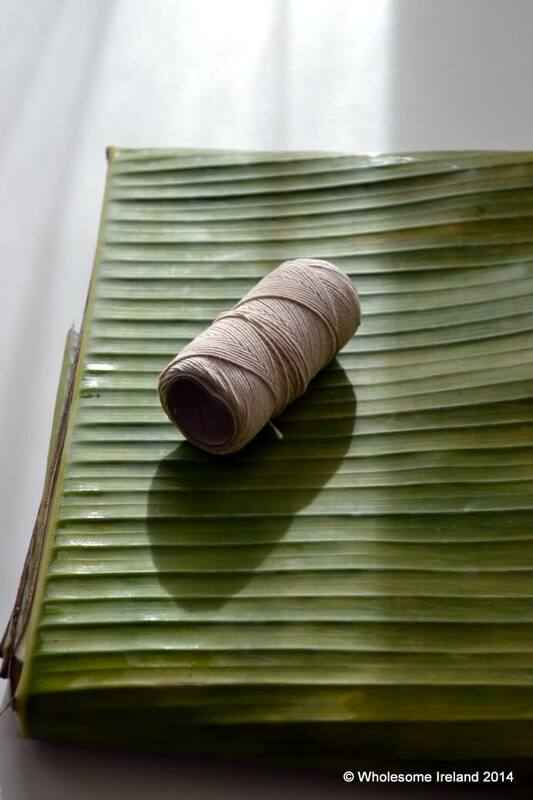 Place 1 length of twine on a clean work surface, a piece of baking parchment directly on top. Next 50g of spinach and then 1 piece of fish on top of the spinach. 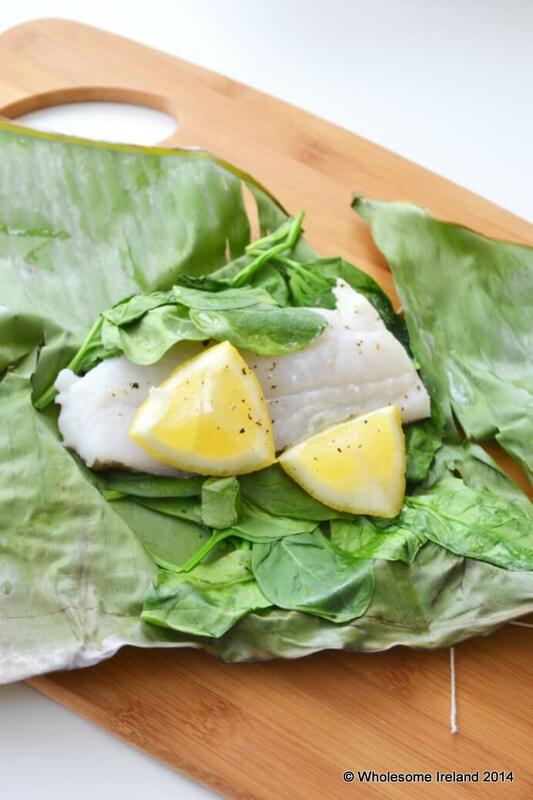 Slice the lemon into pieces or chunks and add a piece of lemon on top of the fish. Sprinkle with freshly ground black pepper at this point if you like. Pull the edges of the paper up and fold on top of the fish so that you get a parcel. Secure tightly so that you have no gaps and tie well with the twine. Repeat this a further 4 times until you have 5 tight parcels of fish. Put the parcels into a deep oven proof dish or tray. Pour hot water from the kettle into the dish up to 1cm height (this is a thin layer). Bake in the oven for 20-25 minutes depending on the size of the fish portion. Serve with steamed potatoes and a side salad. You can’t beat nice & simple when cooking with fish. When the season is right have you ever tried adding some Dulse when steaming with fish? I know it’s not to everyones taste but I think it’s salty / peppery taste works well with the light flavours of many white fish. None on the blog at the moment I’m afraid David! I’ve kept my salt usage to a bare minimum for many years now since switching over to pepper for seasoning. I can go without adding salt to anything but real chipshop chips (which I only have occassionly).